Each Fall, the company where I work for my day job holds a month-long fundraising campaign on behalf of the American Diabetes Association (ADA). Our efforts coincide with San Antonio’s annual Step Out Walk to Stop Diabetes. We form teams and hold lots of fun events to raise money for the ADA – my five-person team is Team Glucose Patrol. We've held a Silent Auction of high-end prizes, as well as a Yogurt Parfait Breakfast that was sponsored by Stonyfield Organic Yogurt. We're also taking part in a pair of company-wide food contests: a Get Fit Smoothie Contest and a Get Fit Dessert Contest. 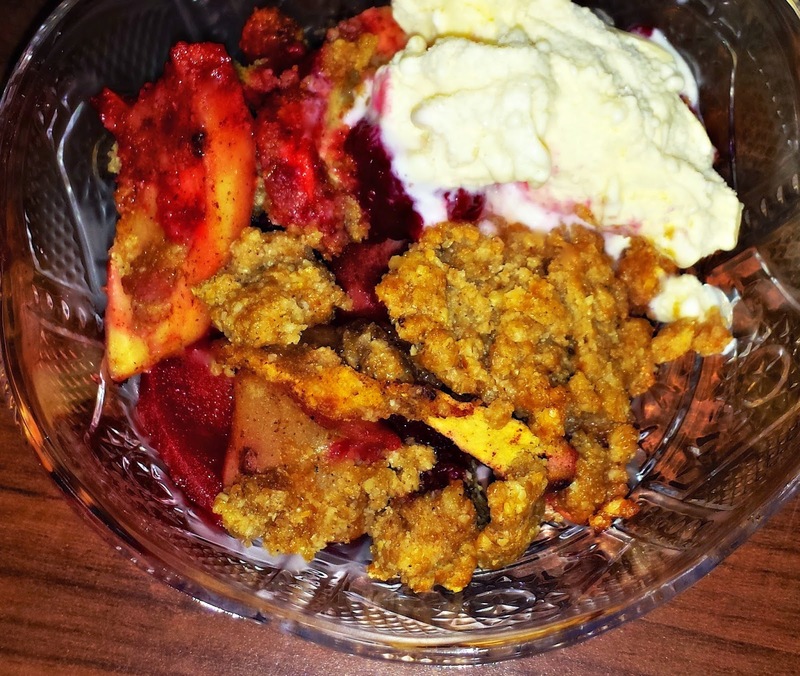 Our entry was a low-sugar Apple-Blackberry Crumble. This dessert is perfect for those who need to watch their sugar intake. Fresh apples and blackberries are tossed with warm Fall spices and a bit of vanilla. The fruit is then topped with an oat streusel and baked until bubbly. This good-for-you dessert relies on the natural sweetness of the fruits, so it only needs a minimal amount of sugar. This crumble is delicious as is, but a scoop of sugar-free vanilla ice cream on top works great too! Step 1: Preheat oven to 400. 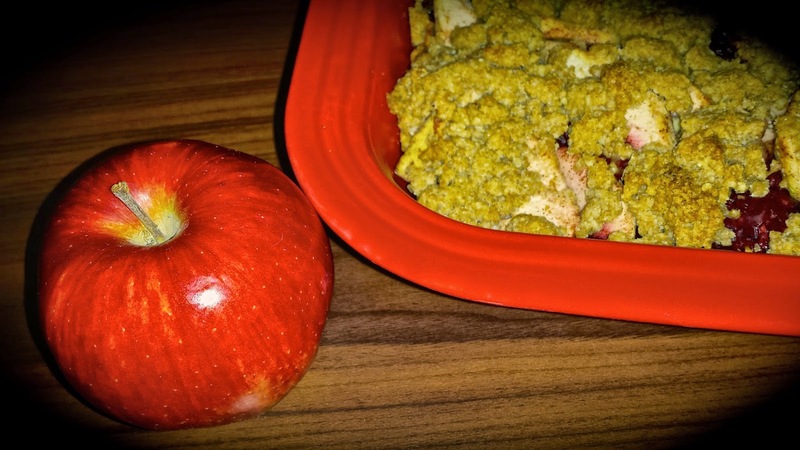 Make the crumble topping by cutting the butter into the whole wheat flour until it resembles breadcrumbs. Add the oatmeal, brown sugar, salt, and lemon zest (if using). Continue to mix with a fork until the mixture forms a crumbly consistency. Step 2: Peel, core, and slice the apples into thin wedges. 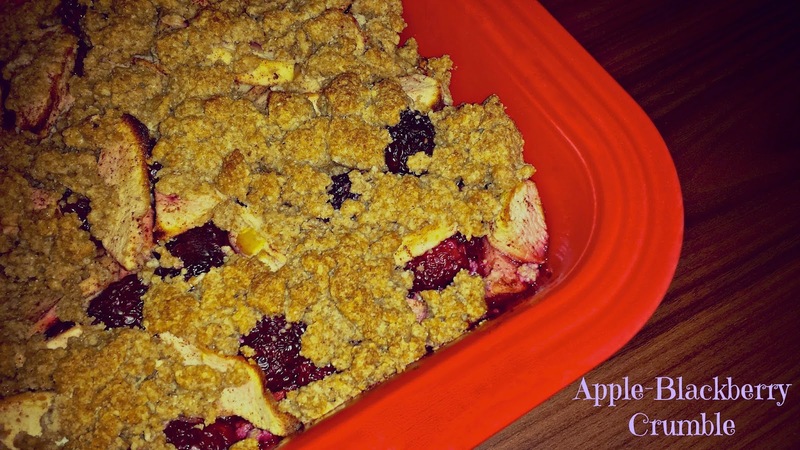 Place the apples, blackberries, sugar, spices, vanilla, salt, and 2 tbs. water in a large mixing bowl. Stir until combined. Place the fruit in a shallow ovenproof 9x13 baking dish. Step 3: Cover the fruit with the topping mixture. Bake for 15 minutes, then reduce the heat to 375. Bake for 15-20 minutes longer, until the topping is golden brown and the fruit is bubbly. Serve the crumble warm, with sugar-free ice cream and light whipped cream on the side. This comforting cobbler-like dessert is perfect for a Fall evening! The warm spices work very nicely with the sweetly tart fruit, and the crumb topping is crunchy and slightly sweet. This dish allows the natural flavors of the apples and blackberries to take center stage, and the sugar-free vanilla ice cream provides the perfect amount of sweetness to each bite. If you have a diabetic family member or friend, this dessert would make a perfect addition to your Thanksgiving dessert table. I can literally proclaim that this yummy dessert is a winner! Team Glucose Patrol's Apple-Blackberry Crumble was awarded First Place in our company's Get Fit Dessert Contest -- earning our team an extra $150 toward our ADA fundraising efforts!! Special thanks to my teammate and baker extraordinaire Victoria for baking this fantastic dessert. The ADA works to prevent and cure diabetes and improve the lives of all people affected by diabetes. If you would like to donate to Team Glucose Patrol’s fundraising efforts on behalf of the ADA, it's easy! Simply click this link to be directed to our team's designated page. All money that our team collects will be used by the ADA to fund its mission to prevent and cure diabetes.